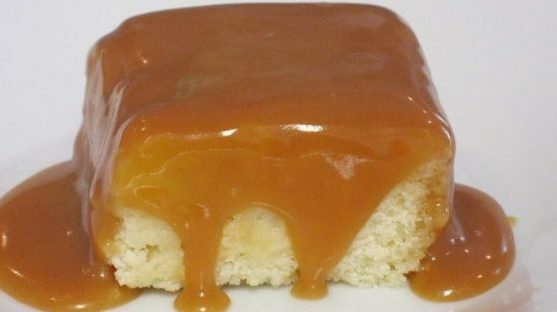 My Caramel Cake is one of the most popular dishes we have ever offered going back to our first farmer’s markets. This cake is super moist with a delicious flavor. It is actually a pound cake which I personally prefer when I’m making a scratch yellow cake. You can use this cake recipe with just about any icing of your choice such as coconut, chocolate, cream cheese, etc. For an especially beautiful and delicious pound cake see the recipe for my Sugar Crusted Pound Cake with Chantilly Cream. This caramel icing is out of this world and was designed from a combination of several recipes. If you want a pretty layered cake this is not your icing. But, if you want the best caramel cake ever and you are willing to make it in a 9″ x 13″ pan, this is the one for you. It’s too soft for a layer cake and needs the sides of the pan to hold it on your cake. Heat cream, 2⅔ c. sugar, and corn syrup to a simmer in a 3 qt. boiler. While this is heating, brown the remaining ⅓ cup sugar in skillet. Add and stir the browned sugar into hot sugar, cream and corn syrup mixture and simmer to just past soft ball stage (240 degrees). (Note: Make sure your cream and sugar mixture is very hot before you pour in your browned sugar. Otherwise, the sugar will crystallize. If is does crystallize, never fear, it will melt again as you reach 240 degrees. Remove from heat and add butter, salt, and vanilla. This can be beaten with a hand mixer until butter combines with hot mixture. Or, you can allow to sit and cool, stirring occasionally. Butter will incorporate into mixture as it cools. When butter is completely combined into icing, it is ready to pour over cake. Note: This icing is too soft to ice a layer cake.